The Deeper Well is Dudley Brown & Irina Santiago Brown’s super premium Shiraz release, intended to serve as a barrel selection of the most age-worthy bits. Indeed, Dudley believes this Shiraz is the best Inkwell wine yet, despite the reputation of the vintage. I don’t share his enthusiasm for ’11 McLaren Vale reds, but I understand the context of why an anomaly vintage (that wasn’t anywhere near as challenging down Inkwell way either). Wild fermented (still unusual in McLaren Vale) and spends 18 months in oak, additions are minimal as shown by the numbers – TA 5.8g/l, pH 3.61. Just 768 bottles made. You can clearly see the wetter vintage here too, with hints of leaf litter over the concentrated black fruit and licorice. Autumn meets summer, and helped along by five years in bottle. Despite the cooler hints, this is still a dark and inky wine (no problems with ripeness at Inkwell) albeit with a slightly rustic edge. The tannins start strong and proud too, before drifting into drying territory as the palate progresses. Importantly, the lack of added acid means a certain softness to this wine that is more than welcome – please Australian winemakers, lay off the tartaric. 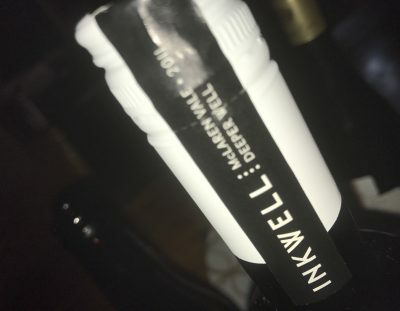 There’s isn’t quite the imposing blackness of some of the Inkwell releases, and the slight warmth doesn’t quite resolve as a result, but the complexity and character of this is welcome in the McLaren Vale context. Clever wine for the vintage, even if it doesn’t hit the highest notes. Best drinking: 2017-2028. 17.7/20, 92/100. 14.7%, $70. Would I buy it? I’d go a glass.